Unit. All the following options are based on this unit. Mark distance: Distance between adjacent ticks. Major steps: Number of intervals between major ticks. 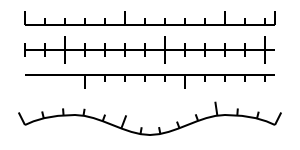 Shift marks by: The number of intervals the marks are shift. Affects the placement of major ticks. Offset of first tick from path start. Mark direction: On which side of path ticks are drawn, referenced from path direction. Choosing Both places ticks on both sides of path. Border marks: Adds major ticks at start and/or end of path. The Ruler LPE applied to a number of paths. Top to bottom: Default parameters. Shift marks by set to 2, Mark direction set to Both, Border marks set to None. Offset set to 60 px, Mark direction set to Right, Border marks set to None. Default parameters on curved path.